How to tie your Belt!!!! Ever been interested in martial arts? Thought about learning but never had a chance? We will be very happy to assist you to take the first step into learning and practicing this wonderful form of art as it will undoubtedly let you grow in so many different ways. whose qualifications (kyu/dan grades) are recognised world-wide. Chief instructor Xavier Boulanger has over 18 years experience in teaching Karate and is also a qualified personal trainer with first aid certificate. Two instructors plus our advanced students help each child learn this complex art step by step. 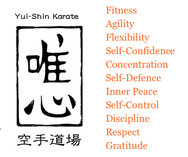 Designed to improve each individual's fitness and abilities by combining body conditioning, stretching and muscular training with traditional Karate techniques.